Even though I am a library student, or maybe because I am a library student, I rarely give the existence of public libraries much thought. I’ve worked in two libraries since I started library school, so I spend a lot of time in them. Most of the time I just take it for granted that if I need information, I can just head on over to the library and look it up. But in Montreal, where I am doing my MLIS at McGill, you can’t be a library student for long without having to marvel that the public library exists as an institution at all. So allow me to indulge my inner history geek and take you on a historical tour of public libraries in my new city. I first noticed that Montreal’s public library system was a little…different than those of other cities when I was hired at the Jewish Public Library. It has a vast collection of Judaica, but it also has all the books, magazines, and DVDs you would find in a secular collection, a fact that always surprises people. Patrons must pay a yearly membership fee. If somebody puts a book from another library through the book drop, we have to call the patron to pick it up because we don’t share an OPAC with other libraries. If a patron wants to borrow a book even from the nearest neighbouring library, we have to do an interlibrary loan to get it. I was confused by all this until I learned that Montreal’s public library system is not nearly as integrated as those of other North American cities. The Jewish Public Library, along with Atwater Library and Computer Centre and Westmount Public Library, operates outside of the main public library system. 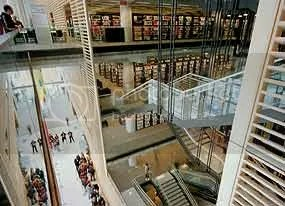 Likewise, the Grande Bibliothèque (Big Library) is a massive, multi-storey library in the downtown core that is often assumed to be Montreal’s central branch. But though it is a partner of the public library system, it is not exactly a part of it either. I have cards for four different public libraries in my wallet right now, none of which are valid in any other. Why is this? Recently, for my Public Libraries class I had to read the IFLA/UNESCO’s Public Library Manifesto. One point in particular jumped out at me: “Collections and services should not be subject to any form of ideological, political or religious censorship, nor commercial pressures.” It is incredible that we live in a day and age where a manifesto like this can exist and that so many public libraries follow it. But Montreal’s somewhat disjointed library system is proof of what can happen when libraries are subject to these pressures. In fact, they can stop public libraries from existing. The idea that the public library should be a place where anyone at all can access information is relatively new. In the early twentieth century, a large number of immigrants came to North America, increasing the need for public library institutions where people could improve their literacy skills and make themselves more employable. Wealthy philanthropist Andrew Carnegie made a point of donating start-up funds for library buildings for cities across the continent on the condition that the cities would cover the libraries’ operating costs (MacLennan, 351). Yet when it came time to make such a donation to the city of Montreal, his offer was refused. This was due in large part to the immense power held by the Catholic Church in the province of Quebec. Since the 1830s, the Church had controlled education, hospitals, and social institutions. There was widespread fear among the clergy that public libraries could subvert the Church’s authority, and so opposition to them was strong (Lajeunesse, 29). Churches instead ran local parish libraries containing only books that had not made it onto the Church’s infamous Index Liborum Prohibitorum, a list of banned books that included the complete works of Hugo and Voltaire (MacLennan). The Catholic Church fiercely opposed any institution that attempted to challenge its control. In 1844 secular professionals and merchants founded the Canadian Institute of Montreal, its mandate “the diffusion of useful knowledge.” It held a number of lectures and debates, and its holdings included numerous volumes on the Index. After much conflict, the Church finally succeeded in shutting down the Institute in 1880, after which time the parish libraries dominated until the 1960s (Lajeunesse, 30). So it is no surprise that Carnegie’s offer to build a public library in Montreal was rejected, as Carnegie’s funding was provided on the condition that the resulting library not be subject to any censorship. Montreal did go on to build city libraries, such as the Bibliothèque Saint-Sulpice in 1915, but these were Catholic rather than public libraries. They were considered an extension of the parish libraries, and though they did collect books on the Index, their catalogue cards were stamped with Rs to indicate their level of corruptive influence: R for “attention,” RR for “restriction” and RRR for “dangerous or forbidden” (MacLennan, 357). There was immense pressure on librarians not to acquire books that could potentially “damage souls” (360). But pressure for change gradually grew. During World War II, Montreal’s French publishing industry flourished as it took over the publishing work of war-torn France, and authors pushed back against the authority of the Church. In the 1960s, during a period called The Quiet Revolution, the Catholic Church’s power declined. Control of schools and hospitals went to the provincial government, and the Index of banned books was finally abolished in 1966 (Lajeunesse, 33). Afterward, a public library system in Montreal grew slowly, but even today it continues to lag behind its counterparts in other cities. Libraries elsewhere in Quebec also face challenges of understaffing, minimal funding, and limited collections. Learning about these conditions helped me to understand why you find so many autonomous libraries in Montreal such as the Jewish Public Library. Libraries run by the Catholic Church were of no use to Montreal’s burgeoning Jewish population; hence the need for a specifically Jewish library. It an excellent example of a community driven initiative. Since there were no public libraries where Jews could find secular reading materials, it made sense for the Jewish Public Library to include these in its collection as well. Even now, when people have alternatives, it still makes sense for the library to offer secular reading materials so that members can find everything they want in one place. I used to think of censorship as a “one-off” sort of thing: a library that bans Fifty Shades of Grey, for example. But my time in Montreal has taught me that censorship not only affects the holdings of a given library, it shapes library institutions themselves. Or, in some cases, prevents their creation. What do you think? Have you seen examples of censorship that go so far as to affect the organizational structure of institutions? Lajeunesse, M. (2012). Public libraries and reading in Quebec: A history of censorship and freedom. Library & information history, 28(1), 26-40. MacLennan, B. (2007). The library and its place in cultural memory: The grande bibliothèque du Québec in the construction of social and cultural identity. Libraries & the cultural record, 42(4), 349-386. How interesting! Thanks for this post! I live in Toronto right now, and the differences are astonishing! If you’re interested in reading about the Church and the very beginnings of literacy in Canada, I’m in the middle of “Paper Talk: A History of Libraries, Print Culture, and Aboriginal Peoples in Canada before 1960,” by B.F. R. Edwards. Although the focus is on First Nations, Edwards discusses the Protestant and Catholic Churches’ roles in establishing print culture in Canada. Cool! Thanks! I will check that out. I am really interested in what library culture looks like in Asia, so thanks for that! I am really interested to see what else Lajeunesse has to say in his book. I do think we ought to be careful about the polarizing language we use in regards to the Church’s Index. I find it problematic that so many individuals use the Index as a puppet in the modern censorship debate without really having more than superficial knowledge of it. In common parlance today people refer to it almost solely as a means of domineering political control without knowing more about how it functioned and came into being (and out of being) in the first place. In the same way that an over-zealous parent will try their best to keep certain books and movies out of the hands of their children, the Index was the Church’s attempt to guide its faithful in their choices about media consumption, which wasn’t a problem before the printing press came into existence. However, because the Index functioned as more of a ‘prohibited books list’, it mostly failed in this ‘education’ aspect of its existence. This is why the church eventually stopped adding to it, because it wasn’t effectively teaching the faithful WHY they should be careful about what they read. It is interesting and important to note that the Index was never formally abolished, only taken ‘out of force.’ The principle that some media may not be fit for consumption still stands. The philosopher Alasdair MacIntyre has some interesting (although sadly unpublished) thoughts on this topic. Laura-what other literature on the Index have you found? The Index is a topic I have developed some interest in, but it seems to be somewhat difficult to find good publications about it specifically, rather than mentions in more general works about censorship. Sorry for my late reply JoAnna, but I wanted to be able to respond more in depth to your comment. The articles I cited in this post speak of the Index as a loathed example of censorship, but did not spend much time examining the Index in any great depth. From what I could gather, I did not see any indication that priests focused much on educating their congregations as to why works on the Index were not considered recommended reading. They were prohibited, end of discussion. Ladwig, J. P. (2010). The index of prohibited books: Liberty, license, and the common good. Catholic Library World, 80(4), 279-283.